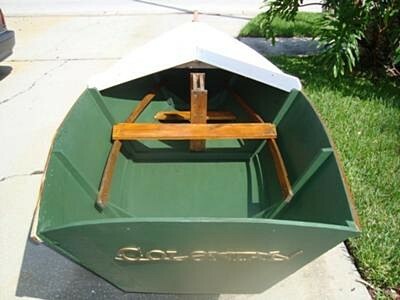 I just got this boat but don't know anything about it. It needs to be repaired because of wood damage. What is the best way to repair this? Old Colonial is back in shape again. The Old Colonial is back in shape again. I will launch her in a nearby lake soon. An update on the wood repair work. Wood stain paint seems to do the job. Still needs a few more things done. Thanks for the great advice you gave me. Hey, she's looking good Kenny. The paint probably won't come off clean so to save time and effort it is better to paint with the same thing she had. I can seal the unpainted wood. She would look splendid if she were just varnished. But, before you start looking for varnish see how well the paint comes off. Depending on how she was painted originally, you might fine it difficult to get it all off cleanly enough to warrant varnishing. The big job was to match the corners together. 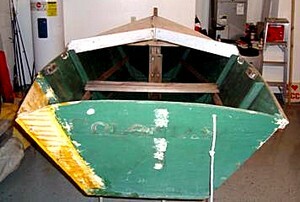 The transom had a curved slope. Now it's starting to look like a boat again. Not sure about setting up for sailing. The rudder it had was home made with rusted door hinges. Didn't like that set up. Maybe you tell me how to make a mast for her. Now I'm thinking I will sand her down to bare wood then use some type of varnish. What is good for varnishing/sealing to give a shiny look? So what are your plans when she is patched up? Are you going to rig a sail? By the way I'm envious of her name plate. I was not clear on exactly what you were explaining but this is what I came up with. It looks pretty good so far. Cut the old wood out replaced with new wood. Wood needs trimming now after the glue drys. Yes she clearly has been set up for sailing. 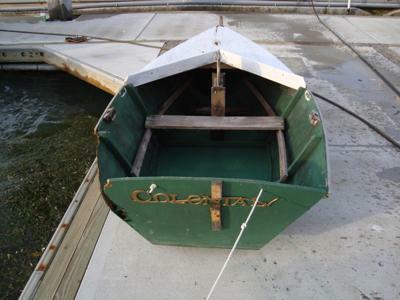 Do you have the center/dagger board and rudder? She probably had a simple single sail rig such as a sprit sail or log o? mutton set forward. At a glance it looks like her problems might have been caused by being left upside down with that corner resting on the damp ground, water has then wicked up into the wood. But that is water under the bridge/transom. 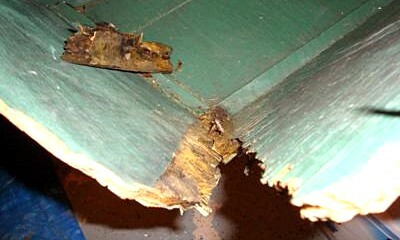 First job as you say is to get rid of any damages wood then treat the rest to get rid of any rot spores. No point doing any repairs if there are any rot spores left in the old wood. 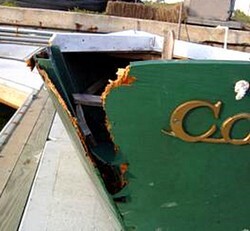 Check the centerboard box too as tend to be trouble areas. There are a number of commercial products available for treating rot but a cheaper alternative is glycol/antifreeze. Give all the surrounding wood a good soaking. When you cut away the damaged plywood try to cut it along straight lines, this will make to easier to cut the replacement pieces. 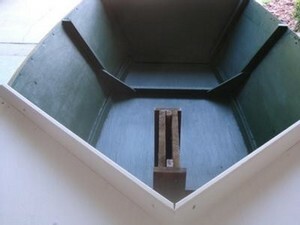 Then get a sheet of marine grade plywood the same thickness as the original. 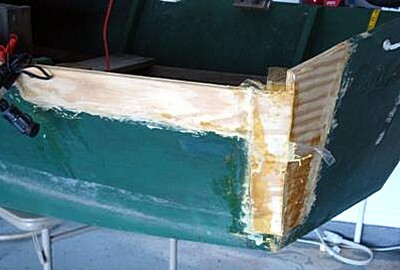 Cut two pieces one to cover the inside of the transom and one to cover the inside of that damaged side. Cut the side piece to fit from the corner to the next frame. Make card or paper templates so you don?t waste any plywood cutting and trimming. These inside pieces don?t have to be full size but they will look less like patches if they are. Once you have them cut to size clamp/wedge them in position then draw on them the outline of the cutaways on the original, also make templates of those cutaways. Then cut out ?infills? from those templates. Glue the ?infills? to the inside pieces, check first that they line up properly. There isn?t much in the way of curve on either the side or transom so these can be glued flat, either clamped or with a weight on top. Use a good waterproof glue or epoxy. Now these can be glued into place from the inside, but the problem will be how to clamp them. Easy enough to clamp along the top with ordinary clamps, but not the lower more important parts, actually it is important to have an even clamping pressure right across the gluing area. The only satisfactory way that I know of doing this with out spending a fortune on lots of fancy clamps is to use through bolts. 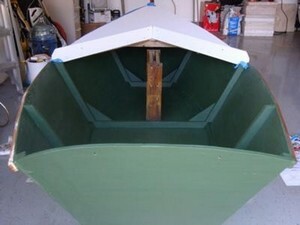 This will mean drilling holes in the side of your boat, but these can be filled afterward with bungs or thickened epoxy. If you through bolt into temporary wooden batons this will help even out the pressure. Wrap the batons in polythene and grease the bolts to stop them sticking. 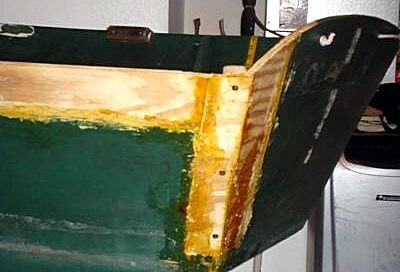 Then glue and screw that frame replacement back into place, replace the missing gunwale and fill, fare and paint. Found rot on one frame that was damaged. So I guess I replace frame piece then rebuild the plywood? How do I fix that plywood? She has a centerboard. Does that mean it's a sailboat? It seems to have a mast step. 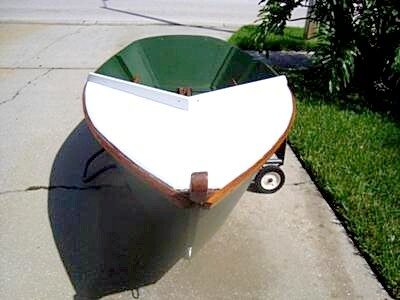 This boat seems to be plywood. The damage is to the left rear on the picture. One piece of frame is broken and the plywood is broken. I think you can see it on the picture. It does not seem to be rotted. So I'll need to reconstruct the rear left corner. What methods should I use? She looks like she will be fine little boat when she is fixed up. You say she has wood damage, is it just damage or rot? Is she made of plywood? Is it the outer skin that is damaged or the frames? Tell us more and hopefully we will be able to specific advice.